This project for the My Favorite Things MTFWSC 367 Sketch Challenge is a fun "just because" card to hold a gift card for the recipient. I made the gift card pocket out of two-sided patterned paper (I can't remember the names of the 6x6 pads I used, if you want to know just leave me a comment and I'll let you know). I feel I made it too large but after handstitching the sides I wasn't going to redo it! The black frame accent behind the pocket is from the Papertrey Ink Shakers + Sprinkles die set. The banner is cut from one of "my favorite" My Favorite Things die sets, the Die-namics Tag Builder Blueprints 5. All the pieces you get in this set are so versatile and I love making shaker tags with the tag dies in the set. The black and white striped banner is from the Stitched Sentiments Strips Die-Namics set. I cut the hearts and banner from the same 6x6 paper pad as the background. I used an EK Success punch to punch the hole in the pocket and rounded the corners with my Corner Chomper. 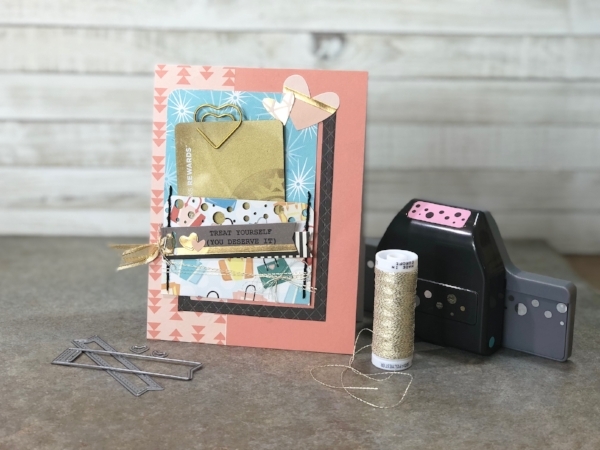 I thought the larger hearts at the top of the pocket are cut from a My Favorite Things heart die set but I couldn't find them on their website.